Lub ob hli ntuj nees nkaum peb, Highland Park Senior High tsev kawm ntawv tuav lawv qhov Winter Pep Fest. Winter Pep Fest pib thaum hoob xya, tag nrho cov xib fwb thiab cov menyuam kawm ntawv mus rau lub gym. Txhua txhua xyoo, lawv tuav Winter Pep Fest hauv lub gym. Thaum pib, lawv qhia peb cov leaders nyob hauv peb cov clubs tiab cov sports. Cov clubs tiab cov sports yog: basketball, newspaper, Black Student Union (BSU), gymnastics, thiab ntau heev. Thaum lawv hu tag nrho cov clubs tiab sports, lawv qhia txog khoom lawv ua tiab haiv txog lawv ua dab tsi hauv cov clubs thiab sports. Thaum lawv hais tag, cov gymnastics pab los seev cev rau peb saib. Lawv seev cev tau zoo saib heev. Thum lawv seev cev tag lawm, cov ntxhais, thiab cov tub hauv qhov basketball team los ntaus pob rau peb saib. Lawv ntaus pob saib seb pab twg yuav yeej. Ob pag pawg taub ob lub pob, lawv yuav tsum pov lub pob nkag hauv lub basketball hoop. Thaum pib, cov ntxhais lawv pov tau zoo tshaj, tab thaum tag, cov tub yeej lawm. Lawv pov tab cev cov dance team los seev cev rau peb saiv. Thaum lawv seev cev tag, cov menyuam kawm ntawv tawm lub gym mus tsev. Winter Pep Fest mus tau zoo heev. 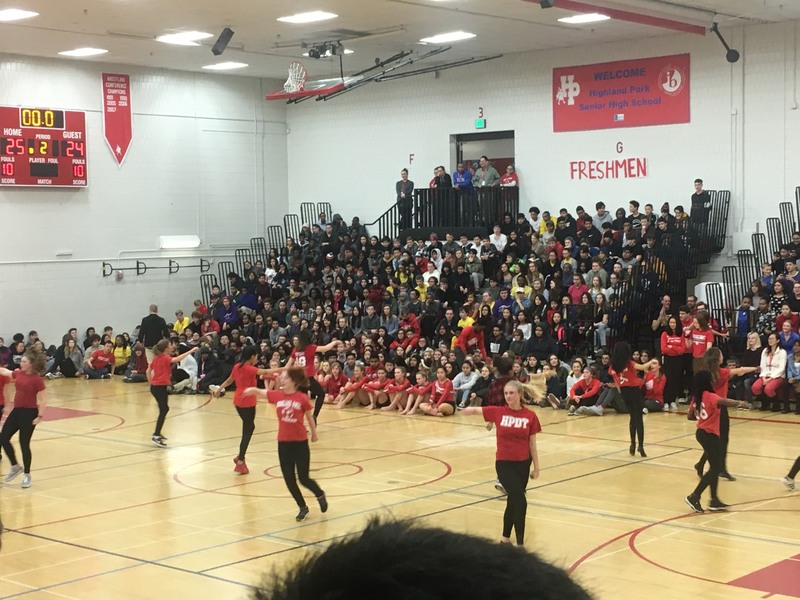 On February 23, Highland Park Senior High had its Winter Pep Fest during seventh period, all students and staff reported to the school’s gym where the pep fest is held every year. 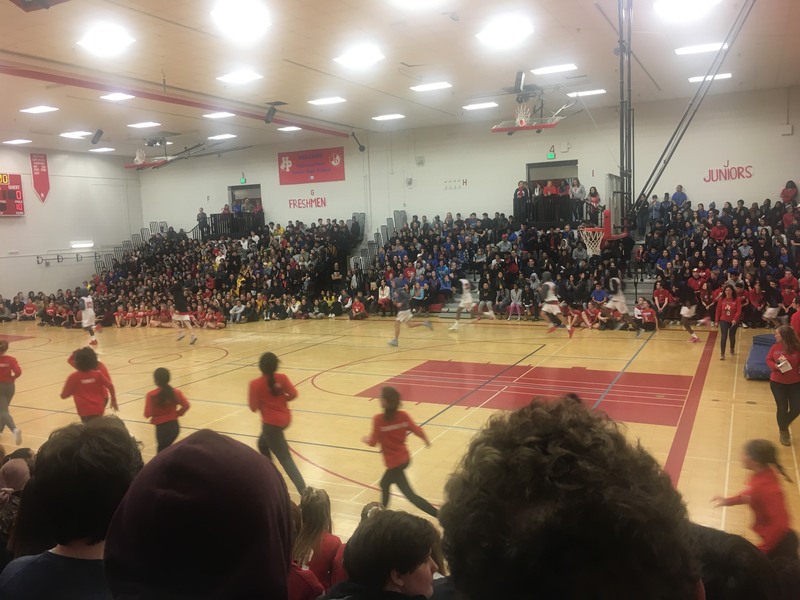 At the beginning of the pep fest, they started it off by introducing the leaders of different school groups and sports. These included: Basketball, Newspaper, Black Students Union, gymnastics, and many more. After all of the school groups and sports leaders had their chance to speak out about their group, and tell the students what they do, the gymnastics team took the stage and showed us just how talented they were. It was hard to look away, with all of their flipping and bending. It’s no wonder why they had such a great season. After their performance, the boys and girls of the basketball teams came out, front and center, to show us their skills. It was a great game; the students in the crowd were shouting and screaming their hoorays! The game was a race for which team could make more shots. They were given two basketballs each. In the beginning, the girls were pounding the boys, making shot after shot. Though people thought that the girls had a good shot of winning, the boys quickly caught up in the end and won. The game was a very, very close one. After the game, the dance team came up to perform. At the end of the performance, everyone left and headed home. The Winter Pep Fest went well.